Visitors to Niagara Falls are accustomed to seeing astonishing sights. This summer, they will see a new one on the Canadian side. Harness-wearing daredevils willing to shell out up to $79.99 Canadian for less than a minute of thrills will swoop down ziplines from a tower 40 feet above street level to a landing pad at the water’s edge below the Horseshoe Falls. The spectacular four-line zipline ride, which will allow riders to fly at speeds up to 44 mph, will operate directly across the Niagara River from the Prospect Point Observation Tower, and will be more visible from the American side than from the Canadian side. The zipline, along with a new 6½-acre aerial Whirlpool Adventure Course attraction being built at Thompson’s Point, a scenic overlook near the northern tether of the Spanish Aero Car, are expected to be open by late July. Outdoor adventure parks like this one have been growing in popularity in recent years, especially in areas frequented by tourists. A similar park operates in Ellicottville. 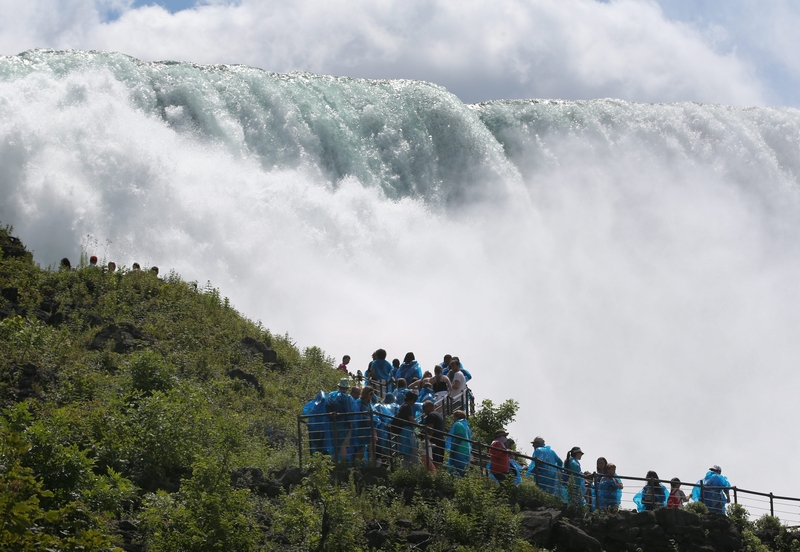 The MistRider Zipline to the Falls will start atop a new elevator tower above the street-level Grand View Marketplace, where people buy tickets to the Hornblower Niagara Cruises, the former Maid of the Mist ticket sales building. Riders will be strapped in and set free, sped by gravity and the wind to a landing pad just downriver from the historic and mostly empty Ontario Power Generating Plant next to the Horseshoe Falls, below Table Rock. A ride ticket will cost $49.99 to $79.99 Canadian, about $38 to $60 American. At the maximum speed of 44 mph, which will vary depending on the weight of the rider, the zipline ride would take about 35 seconds. Riders must be over age 9. The zipline will not pass in front of the Horseshoe Falls or the old Ontario Power Plant building, Adames said. After the ride, people who ride the zipline will be picked up by vans and transported either to the Hornblower dock, if they have tickets to that ride, or back to the parkway level. Adames said that while some riders might scream when they jump off the tower and begin to plummet into the gorge, he did not think the noise would be disruptive. The Whirlpool Adventure Course at Thompson’s Point will be set up as three self-paced courses – classic, extreme and kids – offering suspended obstacles and short ziplines for dozens of climbing, jumping and swinging aerial challenges and games. The basic classic course starts at $49.99 Canadian for adults in peak season, with extras that can add another $30 or so to the ticket. Tickets to the children’s course, open to those age 5 to 12, are $19.99 Canadian regardless of season. Construction on the aerial obstacle course has required that vehicles be barred from Thompson’s Point since mid-May, which will continue for about another two weeks. The Parks Commission encouraged people seeking a natural gorge view to visit the Niagara Glen Nature Centre or the Whirlpool Aero Car overlook. A parks official has said the new attractions it would not affect views of the falls.Adames also hinted at future development on the Canadian side, near the landing pad for the zipline.